I love this game! You get to design your own horse then enter it in show jumping competitions and play mini games with it. My Horse and Me is a unique gaming experience for anyone with an interest or passion for horses. The game features the most accurate horse models and animations yet realized in a video game, alongside a rewarding game play experience, all set against a backdrop of indoor and outdoor environments. I got it because I like horses knowing nothing about it, as soon as you get the hang of steering and jumping it is great! The grooming is not very detailed and you can have multiple profiles. It is only show jumping but it has 5 levels and as you go through you unlock higher levels. There are lots of mini games which are all really good! 2. Can I breed horses in this game? i just got my wii & the game my horse and me. it was really hard! will i get the hang of it? @summer TOTALLY you should get it!!! super game (okay it is a little hard to get the hang of it but...) I LUV THIS GAME!!!!! i ADORE this game!!!!! it's SO realistic & the graphics are excellent. i highly recommend this game! I am looking for a new wii game and this one sounds fun. should I get it? vote please. I got this game from my cousin and i started playing and it was hard but then i did the Mini games and jumping shows. Then i stoped playing it because it froze and then the froze got off. Then i Forget how to play it after a few months. But i still Think this game is soooooo awesome. It is now one of my Fave wii games. It's a great game. I haven't beat it and it's still good. I would get this game if you have patience and a love for horses. I really like this game! I haven't played this game. By the views, some say IT'S AWESOME, OTHERS WOULDN'T RECOMMEND IT and HORRIBLE. Is it good or bad!? >.< Also Is it multiplayer?? i love this game soooooooooooo much that i play it everyday. it's really fun for you to play the mini games and make your own horse. BEST HORSE WII GAME EVER!!!!!!!!!!!!!!!!!!!!!!!!!!!!!!!!! I didn't like the game. It's soooo hard to control. My 12 year old couldn't control it easily. I wouldn't recommend it. This game is really good. It is really realistic and has great graphics. You can own you're own horse (which you have to take care of) and get riding lessons from you're uncle. Once you know the basics it is really fun cos' you get to enter competitions! The dressage is quite tricky but the showjumping and x-country are really good with their real looking obstacles. BUY THIS GAME! It is really good for people who LOVE horses! It is a great game to play with you're friends on multiplayer! I give it.... 5 STARS! Do i want this game? I'm looking for a horse game for my 12th birthday! It looks fun but i want the right game. vote yes or no if you think i should get it! i have the wii version of this game and there is not a lot of stuff to do on it. i beat the whole game in 2 days. this game is amazing you can design your own horse and the show jumping is fun, it takes time to get used to the controls. i wish there was more to do than just jumping otherwise it was a good game. this game is very hard for me. it's hard to control your horse,turn and get the hang of. All of the menus are set up like a snow globe which can get annoying. It's ok i guess but i wouldn't recommend it. 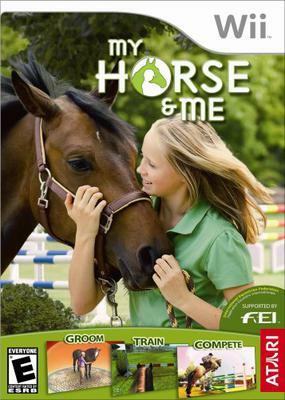 This was a good game, though I prefer "Me & My Horse 2". The graphics are better and there are more things to do & unlock. Realistic and not all fake and weird like most games. Good pic quality and is highly enjoyable! I play a lot and the hours pass quickly! Buy it! This game is very fun! I do competitive jumping like this game and its close to the real thing! :) the mini games are fun too. I would definitely suggest this as your next horse Wii game!